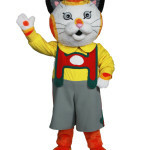 Bring Richard Scarry’s Busy World into your own busy world with beloved characters Huckle Cat and Lowly Worm! Whether together or separate, these two classic Richard Scarry characters bring to life the colorful and playful world of Busytown. 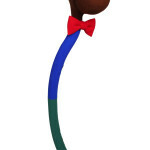 Lowly Worm works as a puppet and can be rented alone or with Huckle Cat. Each are shipped in separate trunks. The rental fee for the Lowly Worm has been graciously provided by the publisher Random House for promotional use only at schools, libraries, and bookstores. The only cost to you is Second-Day Air shipping arranged by Costume Specialists to send the costumes to their next event. Huckle Cat and Lowly Worm are shipped separately in separate trunks. 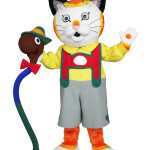 Search for us on Google: Huckle Cat and Lowly Worm Character Costume rental or Huckle Cat and Lowly Worm Character Appearance Program.